Search for the best flight prices from Manchester to Chicago. Compare prices, book today and save money with Manchester Airport. With a civilised metropolitan beauty all of its own – not to mention some of America’s most famous skyscrapers, shopping and hotels – and most vociferous sports fans. Once the legendary haven for gangsters during the Prohibition, it’s now a confident and modern gateway to the beautiful Great Lakes. The Windy City certainly knows how to lay on the glamour. Its five-star hotels number among the glitziest in North America, with spectacular pieces of architecture such as the Trump International Hotel and Tower (401 North Wabash Avenue) leading the luxury market. Wardorf, Four Seasons and Ritz Cartlon all have branches here, and there is also a surprisingly large selection of central, mid-range options. Central Loop Hotel (11 West Adams Street) attracts a corporate crowd with its in-room offices and state-of-the-art business centre, while the budget Red Roof Inn Chicago Downtown (162 East Ontario Street) offers comfortable accommodation housed in a Friends-style block. The fashion capital of America’s Midwest, Chicago amalgamates everything from international designer brands to kooky local boutiques. The centre of the action is the so-called ‘Magnificent Mile’, which is proudly held up for locals as one of the world’s top shopping streets. This is where you’ll find the city’s biggest department stores and international chains – everything from British brand All Saints (700 North Michigan Avenue) to classically preppy Brooks Brothers (713 North Michigan Avenue). For a more eclectic offering, mosey down to the Indie Designer Fashion Market at Randolph Street Market (1340 West Washington Boulevard), discover the treasure trove of Strange Cargo vintage store (3448 North Clark Street), or find the perfect pair of pumps at John Fluevog Shoes (1539-41 North Milwaukee Avenue). 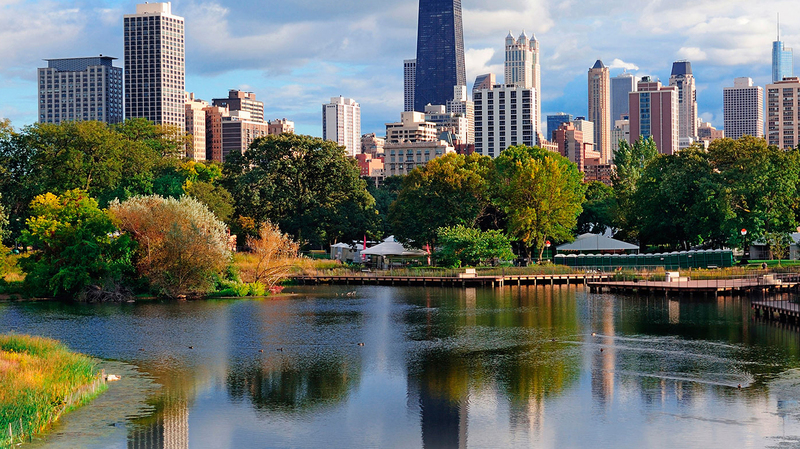 With 19 Michelin-starred restaurants and a colourful array of smaller eateries specialising in every conceivable variety of international cuisine, Chicago has a truly cosmopolitan food scene. Alinea (1723 North Halsted Street), with its three Michelin stars and wickedly inventive molecular gastronomy, is the place to eat in the city – but reservations are notoriously hard to come by. An excellent alternative is Graham Elliot (217 West Huron Street), a contemporary restaurant housed in a 19th-century printing warehouse. Japanese sushi house Arami (1829 West Chicago Avenue) is a secret known only to locals and a few well-informed tourists, while the vibrant Hopleaf tavern (5148 North Clark Street) combines a gourmet range of beers with a creative and well-executed dinner menu. Focussing on independent features, experimental films and documentaries, this quirky film festival is one of the hottest dates in the international movie calendar. Anybody can submit a film for consideration, and awards are given to the best offerings at the end of the festival. Billed as the world’s largest food festival, ‘Taste of Chicago’ is held in Grant Park and supplements the produce stalls and restaurant showcases with a programme of live entertainment. It’s one of the few big events in the city that is completely free to attend. Chicago’s biggest music festival is a three-day-long knees-up, which attracts top performers in the fields of hip hop, dance music, punk and alternative rock. It attracts crowds of around 160,000 every year, and past headliners have included Coldplay, The Smashing Pumpkins and Arcade Fire. An incredible two-million-strong crowd flocks to Chicago during the second weekend in August for North America’s biggest spectator event. Parachute teams, daredevil pilots and fighter jets all vie for the attention of the watchers. This long-running tradition takes place on the Saturday before Thanksgiving and features a guest appearance by Disney celebrity Mickey Mouse. The famous cartoon characters turns on more than one million lights along Chicago’s Magnificent Mile, to the accompaniment of live music and entertainment.